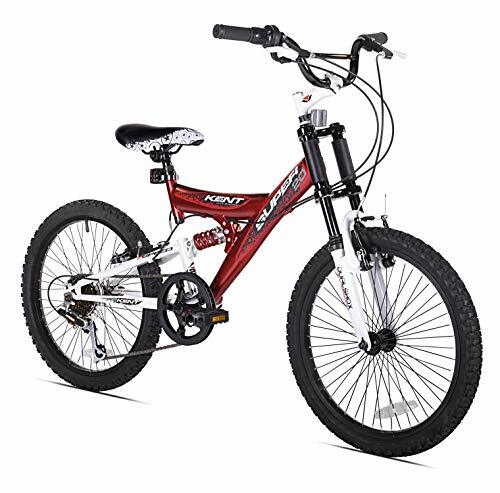 This rugged bike for kids is constructed from a downhill front suspension fork and completely welded dual suspension frame for a seamless ride and superior control. This bike comes with a seven speed gearing with an effortless shifting via the twist grip as well as a seat clamp with an alloy quick release for easier seating adjustment. This super boy’s road bike is machined to guarantee sturdiness, safe-ride, and comfort. Comes with two suspension frame; a down-hill front suspension and a steel frame fully welded dual suspension. The kent super boys’ bike is a great little machine that rides and responds well. It does not ship fully assembled but is pretty easy to put together if you follow the assembly guidelines and diagrams that comes together with it. It offers a good and nice handling and every part of the bike works as expected. The suspension systems are a bit heavy due to its steel construction and the travel distances for the suspensions are fairly okay and will take any beating the kids throw at it with ease. Adjusting the rear suspension is done by just using a knob which is a perfect set up for a bike designed for kids. The bike also comes in available rich colors with a neat paint job that the kids will really love. The brakes too offer excellent and powerful braking force and just as a mountain bike, this bike can also be ridden off road. Generally the bike delivers exceptional quality for a kid’s bike and its performance is on par with most bikes above its rating. It offers a really value for money and performance and it’s definitely worth getting if you want to kids to fall in love with you.